What is a role of architecture in democracy is a grand question to ponder. First critical question can be directed to the volume of buildings in our urban public spaces. The human scale, people and architecture relationship cannot be taken for granted. Architecture may also be a spoiled industry. The problem is that architecture is sometimes taken as harmless, not harming the environment. It is easier to point to the exploitation of environment by oil and gas industries. Democracy plays also with massive volume. It wants to show off. Former governor of NY Nelson Rockefeller commissioned a plan to elaborate Albany as a state capitol. Imagine a relatively small town in Upstate New York that has an appearance of a state capitol hosting democratic ideals in architecture. Such is the story of the Empire State Plaza. The story goes that Nelson Rockefeller drafted himself the basic designs for the Albany’s government campus. Architect Wallace Harrison revised the plan, which included mixed aesthetical styles in it. The aesthetics of Versailles, Indian capital Chandigarh’s urban designs by Le Corbusier (in 1950s), and Brazilian architecture were used as inspirations to create plaza of the democracy: for all the people of New York. Overall, the idea was that the urban massive scale would be visible also as a feature across the Albany skyline. What one can see are the mixed styles of modern architecture and some elements of the baroque style coming from the French palace. Contradictory idea, as this mixture might appeal to people who come to visit the city, yet the city itself is quite small to attract with such a volume. For what reason? To show off the democracy’s playground? Behind this critical questioning is, in fact, a deeper question about the functioning of the plaza/place. How could the massive buildings be incorporated in the people’s everyday life? 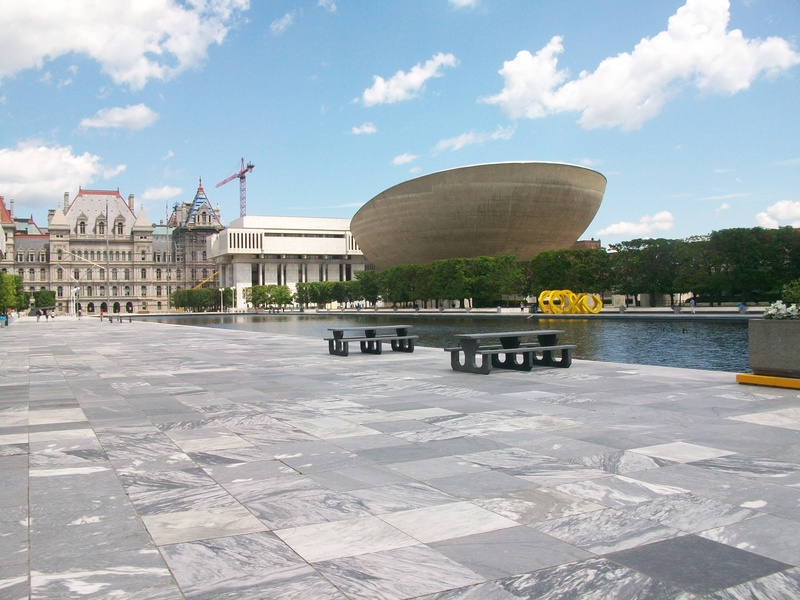 The role of public places, which the Empire State Plaza in Albany also is, is to be building democratic societies. Many architectural associations and sustainable development programs have been pondering how to use this type of urban spaces better. When I was walking on the Albany campus, the buildings around me felt massive. For example, The Egg gives out an exterior, which is changing according to the viewpoint. It looks like a spaceship with a robotic structure from some angles, feeding more an imagination of ‘the off-limits’. The Egg feels too massive and claustrophobic to be inviting as a structure, yet it certainly is full of curiosity, which actually nourishes me with an imagination that the interior might hold happenings that are inventive, new and futuristic. The form gives me expectations. Then again, The Egg is harmoniously nesting in its environment. It shows evidence of an amazing era in modernist architecture. Despite of its massive sculptural looks it appears actually as harmonizing entity. The plaza’s plentiful atmosphere with all the modernist sculptures looks more peaceful with the Egg. The Empire State Plaza campus can be a place where you sit down and eat your power lunch, or mingle like a tourist. Yet it would be hard to imagine that public assemblies would take place in it. It is really not a place for Occupy Wall Street– type of events. In fact, Occupy Albany -protestors were arrested quite soon. The place attracts tourists and visitors, and people, who work in the area in administrative jobs. As hangouts for locals who walk by as part of their daily activity, the significance is of course evident. American society of civil engineers nominated the building with The New York Outstanding Civil Engineering Achievement in 1979. The construction of The Egg began in 1966 and it was completed in 1978. Like the plaza, it was meant for all the people of New York State. The Egg hosts a Performing arts center. A quick overview to the program shows it as quite conservative. One would expect the Egg to host innovative programs, workshops, performances and festivals. It houses the Lewis A. Swyer Theatre and the Kitty Carlisle Hart Theatre; the interior is also reflecting the exterior. The walls are curving upward; the theaters provide intimate settings (Swiss pear wood veneer provides both warmth and good acoustics). Overall, The Egg is made durable. The stem goes deep down into the earth through six stories, and the structure is by a girdle that is made as a reinforced concrete beam. The beam helps to transmit the weight onto the supporting pedestal. Previous PostWorld Design Capital Helsinki 2012 welcomes you!